Security & Partitions > Industrial Security Info > Tenant Lockers - Which Type Works for You? Utilize the right kind of tenant and renter storage: which type fits your needs? 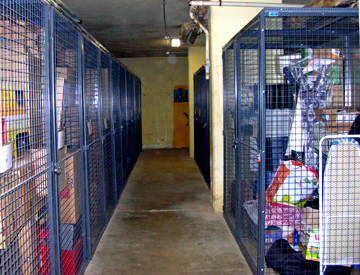 Tenant Storage Lockers provide sturdy, secure storage for residential, apartment, condo, hotels, hospitals, military, government, and business tenants. The ideal tenant locker system is easily reconfigured, easily realigned, and flexible enough to adapt to your changing situation. By using starters and adders, you can build many lockers in a row for a lower cost by using common panels between the units. Using partitions allows you the most options in terms of size, door style, locking systems and configurations. 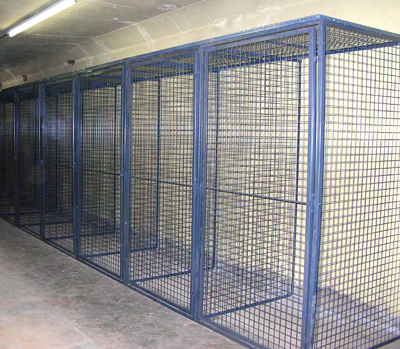 We can help you decide what type of lockers will be utilized to best suit your application. These lockers come in single and double tier configurations, and range from 3'W x 3'D to 4'W x 5'D, and are a full 90" tall. Built with 4-gauge galvanized welded wire mesh, with 1-1/2" x 3" openings. Includes security features such as a full door hinged anti-pry locking bar and padlock hasps. These lockers are perfectly suited to residential applications, since they are smaller than some of the alternatives. Tenants could be leased extra storage space since it's easy to add these lockers to an existing installation. These are larger than bulk lockers, and can be used in conjunction with shelving or racks for more organized storage. They range from depths as shallow as 18" to a maximum of 40", widths of 48" or 94", and either 72" or 96" heights. Hinged doors include a built-in cylinder lock. 96" wide models fit a standard 8' rack for bulk storage. Units come with either single or double doors, depending on the type of tenants. 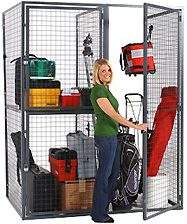 Woven wire residential storage cages offer the largest, most versatile options for tenant storage. They can be almost any size, from a couple of feet to hundreds of feet long, and feature sliding or swinging gates. They can be configured to varying sizes within the same run for larger or smaller storage units. They feature heavy mesh construction and hardware that's inaccessible from the outside. Important: standard sizes listed. Many other sizes and styles are available - contact us for assistance. We can help you lay out exactly what's needed for either existing structures or new construction. 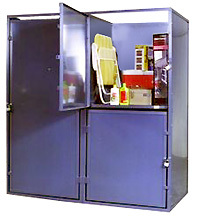 Solid lockers provide tenant privacy. These provide bulk storage, but have solid metal sides that are not open to outside visual inspection so your renters or clients can preserve privacy in the storage area. Some families in multi-family installations may prefer the security and privacy offered by these lockers. Can be offered in single and double tier configurations. Contact us for assistance on this type of storage unit locker.